Stuck In The Buckosphere: Big temperature swing! We are about ready to see the a touch of summer, then a touch of fall within a short amount of time. Highs will likely reach the 90's for Tuesday and Wednesday for Central Ohio. By Friday morning and Saturday morning we will likely see temperatures (in the city) fall down to the lower 50's. Outlying areas should easily hit the 40's. I know some people say that temperatures fluctuating does not directly affect our immune systems... but if you disagree... then get ready! And our chance for rain is pretty slim as well for the coming days, despite the heat. 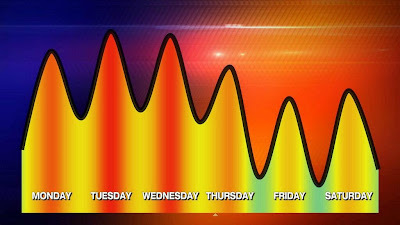 Highs in mid 80`s for Monday and pushing into the 90`s for Tuesday and Wednesday. With the heat and humidity, pop-up afternoon showers and storms possible. A better chance for rain midweek. A cold front will swing through late Wednesday with a better chance for rain and much cooler temperatures for the end of the week. The weekend, right now, is looking clear and VERY comfortable. Thursday and Friday are my next days off and I am already looking forward to them... after this nine day stretch of working. Have a good one! Ready for the big drop?